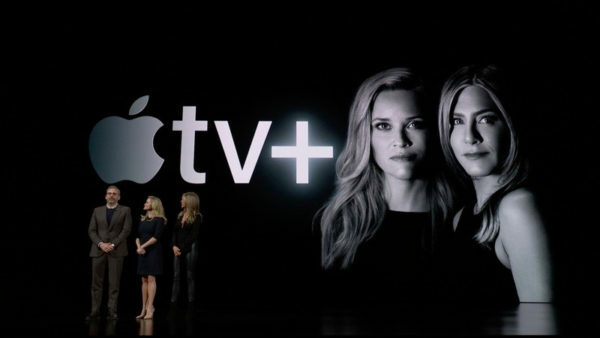 Apple unveils original projects with stars including Reese Witherspoon, Jennifer Aniston and Steve Carrell. Apple unveiled its much-hyped video-streaming product on stage at the Steve Jobs Theater on Monday morning, introducing dozens of original, star-studded TV and film projects with it. At the Cupertino, California media event — which Apple named “Show Time” and touted with an all-out marketing campaign complete with trailers and teasers in the days beforehand — Apple revealed two major new products around video entertainment: Apple TV+, a premium video-streaming subscription service with dozens of new original titles (referred to by executives as the “best stories ever told” and projects that “will make us believe anything is possible”), and Apple TV Channels, a new offering inside the Apple TV app that offers à la carte subscriptions to existing television and film services. Apple said Apple TV+ will be available across devices online and offline starting in the fall, but the company did not announce a pricing model. Reese Witherspoon, Jennifer Aniston and Steve Carrell joined Apple executives on stage to debut a series called The Morning Show, which the actors said is a “high-velocity thrill ride” that offers an inside view into the “complex relationships between men and women in the workplace.” Jason Momoa and Alfre Woodward announced a series called See, and Kumail Nanjiani announced Little America, a half-hour anthology that will tell stories around immigration. Sara Bareilles and J.J. Abrams took the stage to announce Little Voices, a comedy-drama series around music. Filmmakers including Steven Spielberg and M. Night Shyamalan also appeared in a video promoting Apple’s new original television projects. The last “storyteller” to appear on stage was Oprah Winfrey, who is working with Apple on two documentaries themed around workplace relationships and mental health. I am interested in the Apple News service as it will appear here in Canada. $13 a month, right? Will this service require Apple hardware? Anyone here considering this service? Joe, I don’t think I would pay $13 a month for news that is sanitized by some indoctrinated Apple employees in Cupertino. I wouldn’t even want it if it was free.